Chalcopyrite (yellow) shows faint reflectance differences (bottom right) due to compositional variations. It encloses small pyrite crystals (light yellow, high reflectance, top right). 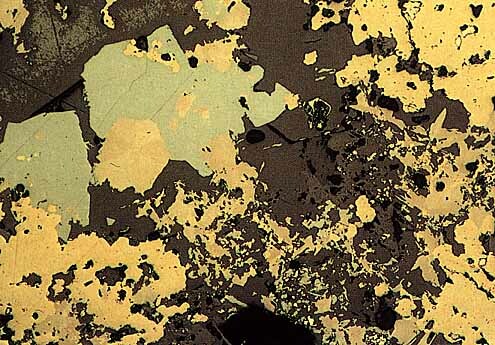 Argentopyrite (brown) shows bireflectance and reflection pleochroism (light to dark brown) and is sector-twinned (centre left). Coarse-grained pyrargyrite (blue, centre left) is intergrown with argentopyrite. Minor amounts of fine-grained acanthite (blue-grey, bottom centre) are intergrown around argentopyrite in the calcite (grey) gangue. Carbon coating (top left) is light green-grey. Black areas are polishing pits.